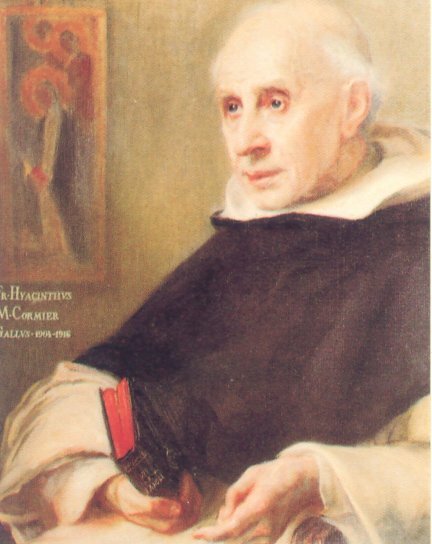 Today the Order celebrates the commemoration of a modern beatus of the Order—Blessed Hyacinthe-Marie Cormier, Master of the Order. He is probably best known as the founder of the Ateneo Angelicum which is now the University of St. Thomas Aquinas or the Angelicum in Rome. Bl. Hyacinthe-Marie has a special place in our hearts because it was through the example of Bl. Agnes of Jesus of Langeac, a Nun of the Order, that he became a Dominican! Because our foundresses and first sisters were almost all of French-Canadian origin we have many old french books in our library. It's something to look at these shelves and see the many books by such luminaries of the Order as Fr. Lacordaire and Bl. Hyacinthe-Marie Cormier. There are one or two lives of Dominican saints by him, also: a life of a saint by a saint! Maybe someday these books will be translated into English for us poor monolinguists! Born in Orléans on 8 December 1832 and ordained a secular priest in 1856, Louis Stanislas-Marie Cormier joined the Order of Preachers that same year, having chosen while a seminarian to live by the rule of the Third Order. He took the name Hyacinthe-Marie, and was involved in the movement to restore the Order in France, initiate by Henri Lacordaire and continued by Vincent Jandel. From the time he made solemn profession until his death (1859–1916), he found himself entrusted with the responsibility of formation and government: Master of Novices, conventual prior, provincial, Assistant and Procurator General, and in 1904 Master of the Order. He fulfilled these offices with admirable prudence, inspired by a genuine love for religious life, in which he proved himself a generous father and a wise master. If conformity to Christ was his goal, he lived the Christian mysteries in union with Mary through the prayer of the Rosary and by closely following the life of Saint Dominic, in whose name he knew well how to take upon himself his own affairs and those of the Order. Pope John Paul II solemnly beatified him on 20 November 1994. The remains of this blessed rest in Rome, in the church adjacent to the Pontifical University of Saint Thomas, the “Angelicum,” which succeeds the “Ateneo Angelicum” founded by him in 1908. His liturgical commemoration is fixed on this day, the anniversary of his election as Master of the Order. Without Sunday how could we live?